As I get older I start to understand more and more the reality of craving certain types of food during specific seasons. Summer is dripping with cool, fresh fruits to quench our appetites while winter arrives and we immediately want that full feeling that comes with warm foods full of whole grains, spices, and more. (soups, pies, gourds, meat, etc.). An epitomical food that fills your homes with the aroma of pure holiday joy is gingerbread. Packed with flavor, bursting with spices and so satisfying. This 100% whole grain loaf will keep you fuller longer and with give the bread a toasty, nutty, wholesome flavor and texture. The day I made this in my home was immediately after a cold front swept through, plummeting temperatures, bringing the leaves of the trees down with it and inversely raising my craving for classic holiday breads. Lucky for me I had most of the staple ingredients on hand to make this delicious loaf on this dark, rainy day. So I gathered my ingredients, pulled out my mixer and got to work. 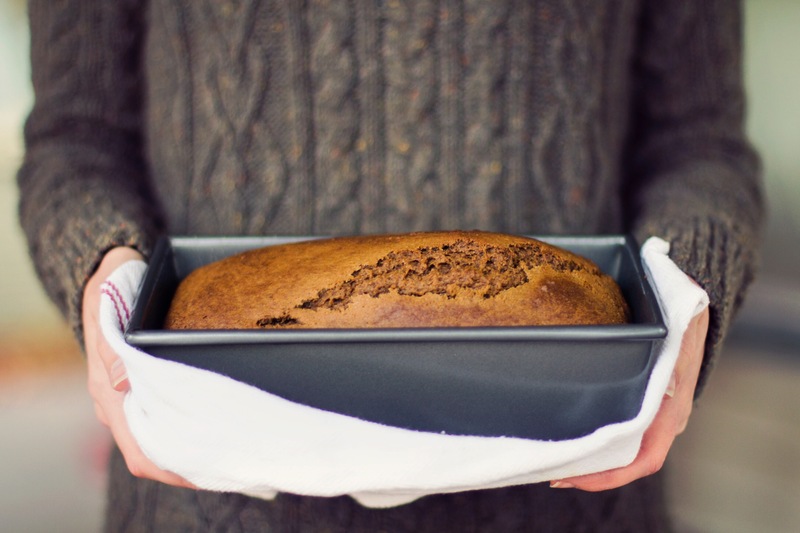 This loaf is so easy and quick to make that you can do it without anyone else at home knowing that you’ve made anything except by evidence of the delicious waves of air floating from the kitchen’s heart. 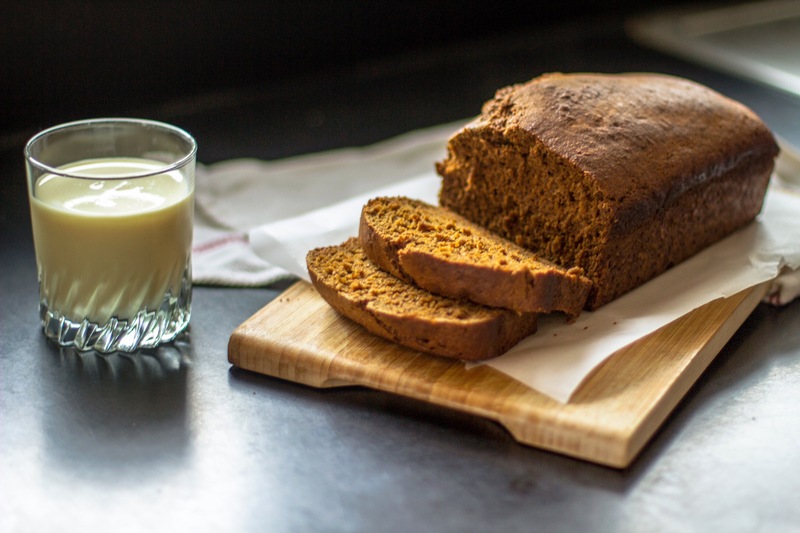 Based on traditional gingerbread recipes I’ve made a few quick and easy swaps for a slightly more nutritious sweet bread. As always the quality of your ingredients will make the greatest impact on your end result. Try to find organic and non-gmo ingredients where you can. *To kick-up the flavor of your loaf, lightly toast your spices in a skillet over medium heat for about 5 minutes or just until they become fragrant. Continuously move them in the pan so they don’t burn and grind/grate them fresh for use. **Ginger is very easy to peel with the back of a regular spoon. Peel your ginger before finely grating your root piece. 1 Tbsp will be about 1-1.5″ of a piece of ginger root. Preheat your oven to 350F (325F for non-stick pans) and position the rack to the center of the oven. Pre-grease a loaf pan and set aside. 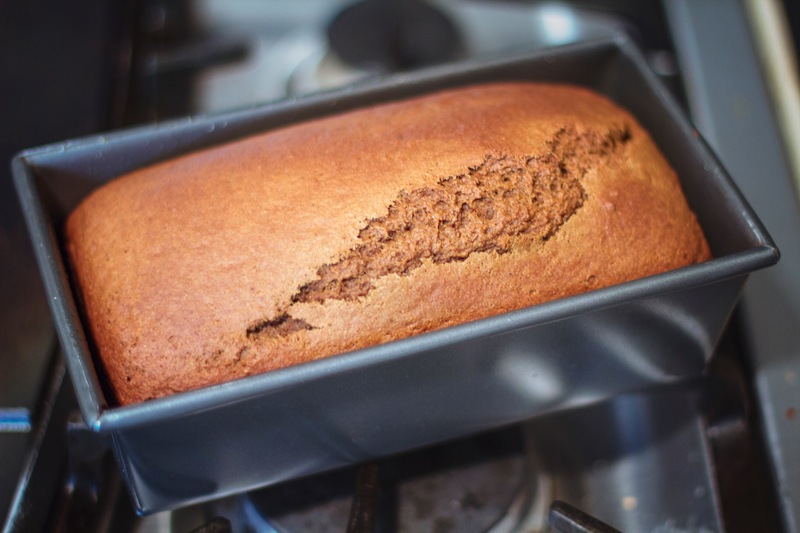 I personally like the chewy edges I get from using a metal loaf pan, but any will do. In a large mixing bowl whisk together the dry ingredients until well blended and set aside. In the bowl of a stand mixer lightly mix your eggs, applesauce, and ginger. Pour in the molasses, maple syrup and vanilla extract and beat on a medium-low speed for about a minute, making sure to scrape down the sides of the bowl. While still on medium-low speed slowly add in the dry mix until just fully combined. This should take 1 to 2 minutes. Be careful not to overmix your batter. Pour your batter into your loaf pan and smooth it out and let sit for at least 30 minutes to help the flour fully hydrate the wheat for a more tender crumb. Bake in the oven for 50-55 minutes or until a crisp-like crust starts to lightly brown on the top and a toothpick can be inserted and removed cleanly. The top will split a bit as it rises in the oven. Let cool for 30-40 minutes before slicing and serving. Store in an airtight container in a cool, dry place for up to 3 days. This bread is great reheated in the toaster for a crispy, warm breakfast on a cold winter’s morning. Can be served with salted butter, with yogurt and nuts, or as French toast at the end of its life topped with a handful of toasted or candied nuts. This bread is also great as a gift for friends and family, they may have a hard time building houses out of it though!